World Breastfeeding Week is celebrated across many countries on first 7 days of August (Aug 1 – 7), Promoted by World Health Organization (WHO) and United Nations Children’s Fund (UNICEF). The purpose of this week is to increase the awareness and importance of breastfeeding. This helps to build the infant’s immune system, provide essential nutrients and support baby development. Breastfeeding, a mother requires having the exact diet, so that the milk is filled with all the accurate nutrients. 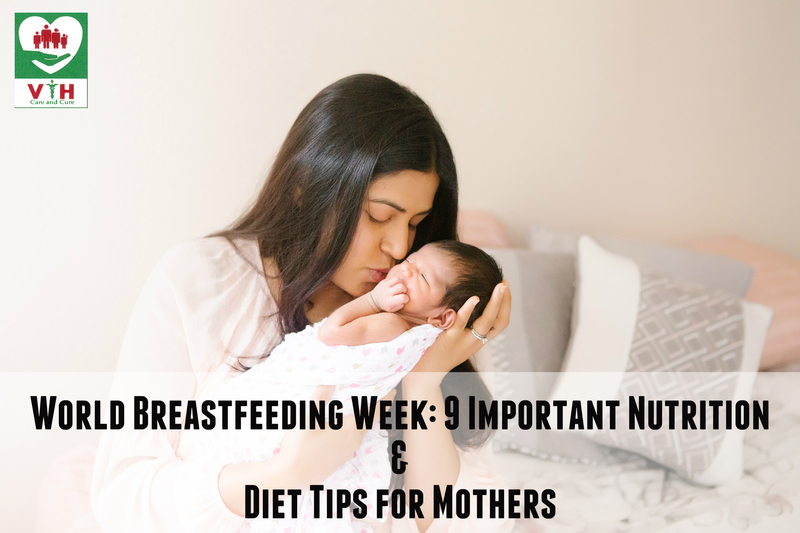 Venkataeswara Hospitals are a Multispeciality Hospital in Chennai, sharing 9 Important Nutrition & Diet Tips for Mothers on this World Breastfeeding Week. Foods which contain high proteins such as cereals, whole grains, dried fruits, pulses, eggs, chicken, vegetables and fresh fruits are fine for the mother and baby. Lactation demands an extra 500kcal in the diet of a breastfeeding mother. Here breast feeding mothers are recommended to eat a healthy food diet with the exact proportions of vitamins, iron, proteins and calcium. Maybe water isn’t technically a food. It is advised to drink at-least 8 glasses of water a day. It guarantees the regular supply of milk. We are the Best Hospital in Chennai, always advice Breastfeeding mothers to carry on a bottle of water close by, although they are not thirsty. Venkataeswara Hospitals recommend every breastfeeding mother to have the carrots. A carrot has beta-carotene, which is good for lactating mothers. Women’s are always to stay hydrated by consuming tender coconut, fresh fruit juices, lime juice and lassi. Moreover, adding up garlic to your food will increase the deliciousness of your dish and also it helps to raise the milk supply. Oatmeal is very light and provides exact nutrition. Breastfeeding mothers are direct to include oats as a part of their diet plan, because it assists to reduce cholesterol, regulate blood pressure and enhance the milk supply. In the postpartum period up to 3 months, Women are recommended to carry on the supplements of iron and calcium. Most of the Gynecologist in Chennai, always recommend to take Iron and calcium rich food into their diet plan. Traditionally, women are given food loaded with heavy part of ghee. And there is no proof that, it increases in breast milk production. Instead, they can take milk, yoghurt, fresh fruits and juices. All the above nutrition & diet tips are definitely increasing the milk supply, if you follow these tips in the right manner.